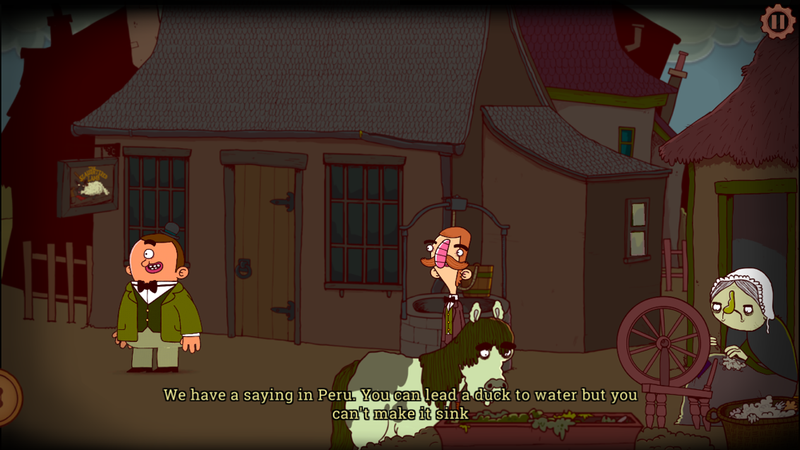 Bertram Fiddle has had quite the journey in getting his latest adventures recorded and turned into a video game. 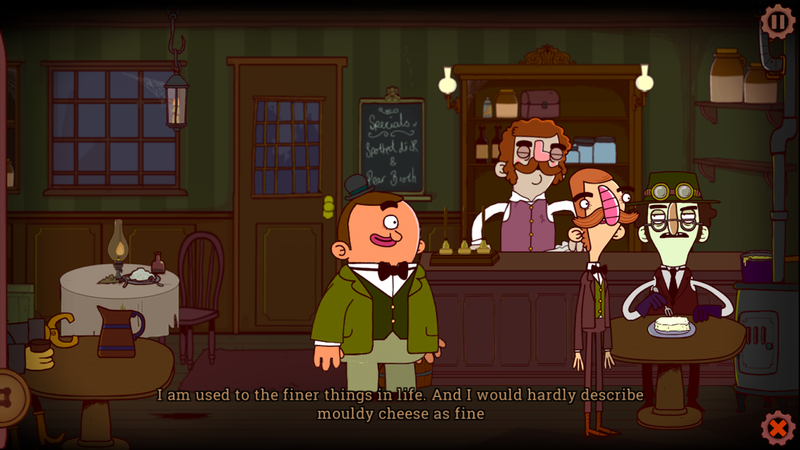 It’s been a bumpy road, but after a successful Kickstarter and many many delays, we finally get to play A Bleaker Predicklement, the second episode of the point-and-click adventure that follows Victorian England’s finest explorator as he hunts down the elusive Geoff the Murderer. 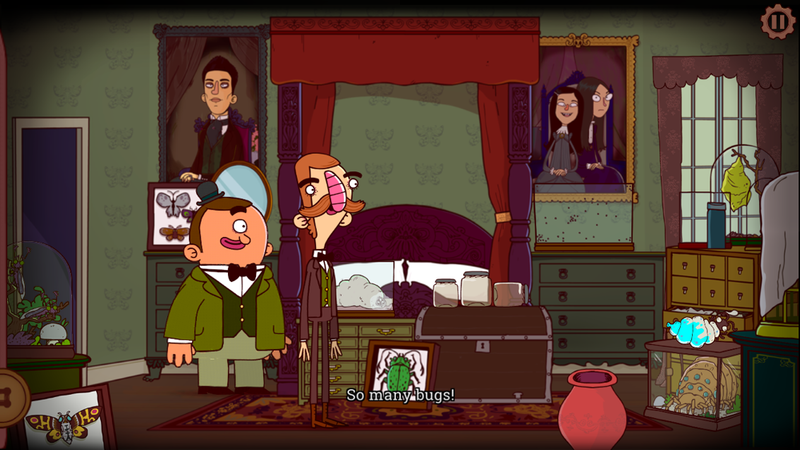 Even after release, Bertram’s handlers, Rumpus Animation, were not able to relax, as some game-breaking bugs were found. But it’s a testament to how enjoyable the game is that I never lost interest in it between all the waiting before and after release. And now that the nasty bugs have been squashed and I was able to finish the game, I can say that it was most assuredly worth it all to experience this gem. I, for one, am so glad I finally got to spend more time with Bertram and his Peruvian cyclops manservant, Gavin. 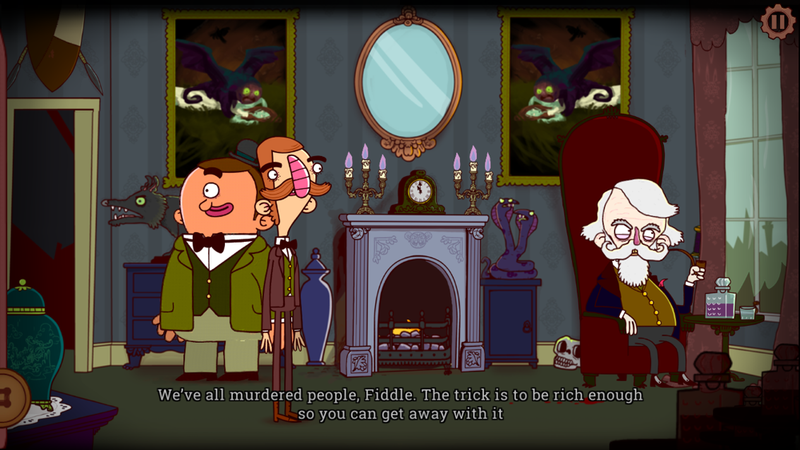 The main attraction of A Bleaker Predicklement is the detectivating protagonist himself, but he’s joined by a huge cast of characters with silly names and voices, like Lord Arthwipe and Professor Scuttleworth. Sherlock Holmes also returns to insult Bertram and try to steal the spotlight, while Watson meekly apologizes for him. Everything is voice acted so, although the game does allow you to skip dialogue if you’re a fast reader, I highly recommend taking your time and listening to all the characters do their thing. This is a game to relax with and soak in all the details, not rush through it. Just about every item you tap on will provide a groan-worthy pun, so make sure to interact with everything. The game picks up some time after the first episode left off and finds Bertram working at the dreadly soap factory he so desperately tried to avoid. 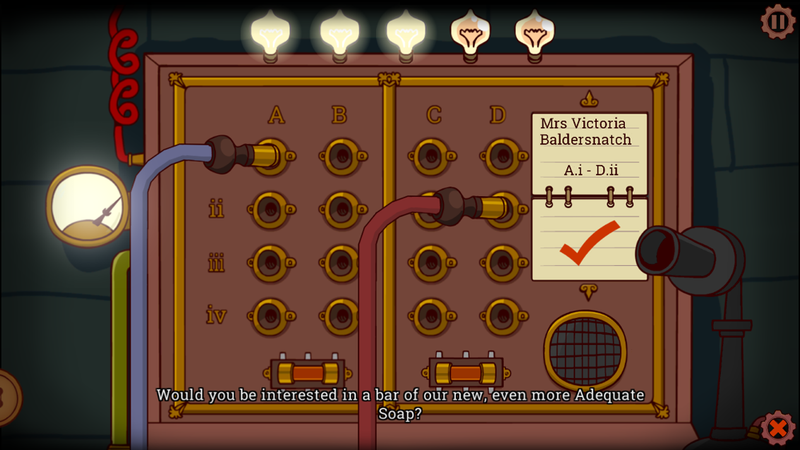 As much as he insisted to his wife that he is an adventurer and can’t be arsed to do such mundane work, the lack of murderings left him no choice but to seek employment selling Mr. Dulsworth’s Adequate Soap to the filthy denizens of Victorian London. Just as Mr. Dulsworth finishes scolding him for falling asleep on the job, Bertram gets a call from his boss’s mother to see what he’s been up to. It turns out that Mr. Dulsworth has been sneaking off on some secret business, so Bertram needs to finish up his cold-calling and leave the soap factory to look for him. Before the first chapter ends, Bertram will find himself in quite the predicklement as he’s framed for a murder he didn’t commit. With the help of his faithful manservant, Gavin, he’ll break out of jail and set out to clear his name and catch the real murderer. Together, the two of them will visit the Adventurer’s Club, a toy shop, a butcher shop, a curiosity shop; brave the stinky sewers; wander the countryside; explore a menacing mansion; and meet mad scientists, quirky carnival folk, man-eating monsters, evil twins, Doug the Bounty Hunter, and — the strangest of all — a hipster who doesn’t like moldy cheese. One thing you can’t say about their adventure is that it’s boring. 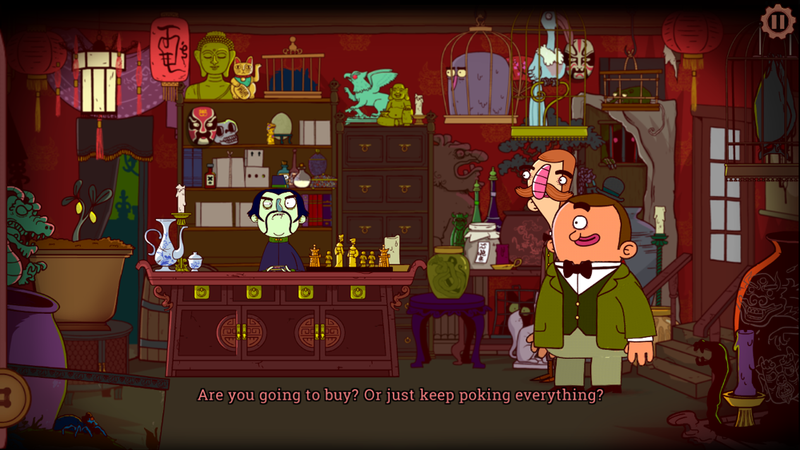 The game, like most point-and-click adventures, involves a lot of running back and forth between scenes as you try to figure out what you need to do next, what you can do with the items you have, and what you might have missed. In some games, this can feel like a chore due to pixel hunting, slow movement, or un-skippable dialogue. But A Bleaker Predicklment is very user-friendly, making the exploration and puzzle-solving enjoyable instead of painful as being poked by Pokey Mary all day. Bertram’s normal walk speed is a slow slug’s pace, but you can double-tap to make him run like a frisky kitten. You can also hold a finger anywhere on the screen to locate all available hot spots. This means you’re not pulling a Pokey Mary on your iPhone screen trying to see what you missed. Instead, you can just focus on the story and puzzles and leave the hidden object games for your mother-in-law who thinks you’ll never amount to more than a soap salesman. There’s no hint system in this series, exactly; instead, clues are given in the form of puns as you fiddle around with things. Characters will indirectly give you a hint as to what you need, say by slyly mentioning cheese or a rock or any of the other items you’ll come across. Gavin also provides some hints in the form of famous Peruvian sayings. So you need to pay close attention and not just shrug everything off as a silly pun. The puzzling mostly involves figuring out which items to use where and when and how. There are no skill-based mini-games or anything that should give you any trouble if you’re not ready to test your reflexes. A puzzle might involve fixing a broken robot, pulling an aching tooth from a caged gorilla’s mouth, unshackling an escaped convict so he’ll share his map of the Swamp of Sadfulness with you, or a particularly fun early section that has Bertram and Gavin separated and passing items between each other. All the puzzles seemed logical, with some taking me longer to solve than others. I never felt that any solutions were unfair, though. As lovely as the game is, there are some improvements I’d like to see, such as the ability to select a chapter, or more control over save files. iCloud syncing would also be welcome, as it’s a game that plays well on both iPad and iPhone and is fairly long. Also, right now the game is stuck in the orientation with the home button on the right. It’s a minor inconvenience, but I would still like to see the option to rotate it. Opening the inventory is also a bit clumsy, as the selection area is very small. It’s not a huge deal, but it did slow me down sometimes as I had to tap several times to get it open. The game also isn’t full screen on iPad, unfortunately, but that’s just another small niggle. And here I’m getting really picky, but there’s a meat mound where you can take slabs of meat and make a face — or whatever your heart desires — out of them. It would have been nice to have it included as a mini game that you can play at any time, not just when you’re in the butcher shop. Now, what saddens me is that, as wonderful as the game is, some plans did get scrapped due to lack of time and resources. Rumpus Animation set some big goals for this new game and didn’t get to meet all of them, including the Emmelina Snoopsworth side quest Kickstarter stretch goal. That doesn’t change anything for me as far as recommending the game. It’s still lovingly crafted in all its glorious silliness. But knowing that some things had to be cut makes me wish we lived in a world in which Bertram’s adventures could be shared with the world as soon as his creator, Seb Burnett, thinks them up, without having to worry about those pesky things like time and resources. But instead, I fear this may be the last we see of Bertram, and the fact that it wasn’t everything Rumpus Animation wanted it to be just makes it sting all the more, even if I enjoyed every second of it. I hope this isn’t the end of Bertram’s adventures, and by some miracle we’ll get an even grander story featuring the large-nosed detective. I’d hate to see Bertram working in a soap factory for the rest of his life, as he’s so terribly good at adventuring. But if it is his last adventure, that’s an even stronger reason to play this game, if somehow you haven’t been convinced yet. 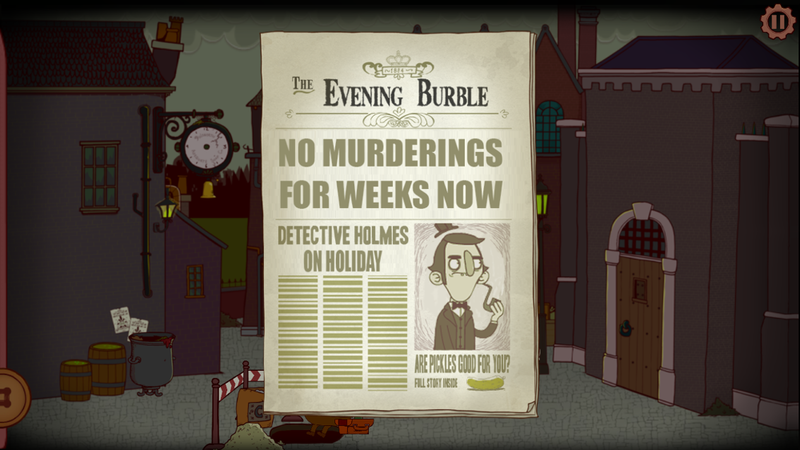 Bertram Fiddle: Episode 2: A Bleaker Predicklement is bigger than the first episode in every way. Yes, it had some hurdles to overcome before and after release, but the current update appears to have fixed any major bugs, as well as lots of little ones. Don’t rob yourself of this truly enjoyable experience. 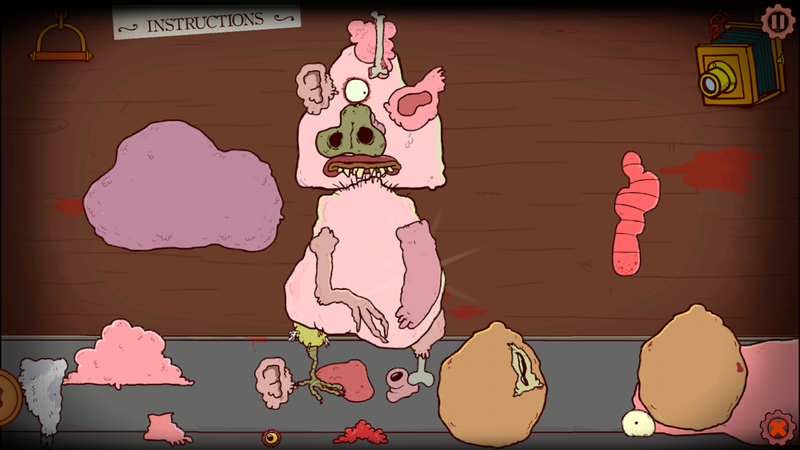 If you’re a fan of humorous point-and-click adventure games or puns or cyclops assistants, or just want to see what sorts of strange things will happen to Bertram, just stop reading and grab the game here. You’d be hard-pressed to find a game with more love poured into it. And if you get stuck and need some help, try my walkthrough guide.